I love Pandora. It is usually streaming in the background of just about everything that I do. I have favorite channels for different activities, and I have found so many artists that are now part of my iTunes library an have become new favorites. 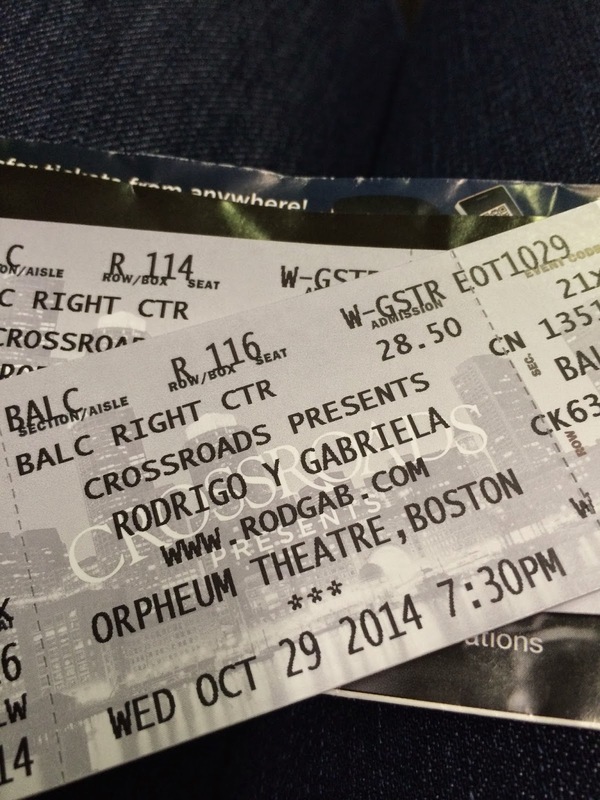 Rodrigo y Gabriela are an example of a new favorite, and when I found out through Goldstar's discounted ticket program that they were coming to Boston, I knew we would go. Rodrigo y Gabriela are guitarists from Mexico who, heavily influenced by rock bands, such as Metallica, became famous as street buskers on the streets of Dublin. Their energy and talent are unmatched. Their music has been featured in the films Shrek and Puss and Boots, as well as in the pilot for Breaking Bad, and even Monday Night Football. So after a late start and heavy traffic, we finally made it. from the Boston Common's Park Street station...easy in and easy out. The show opened with Norwegian guitarist, Øystein Greni, who is the singer and lead guitar player of the Norwegian rock and roll band BigBang, who joined Rodrigo y Gabriela on the 5-week American part of their tour. It was a great set, and he set the stage for what was to come. And Rodrigo y Gabriela did not disappoint. Diverting from a typical set list, they took requests and shared stories with the enthusiastic audience who seemed to know and love every song. We left smiling and energized. It was a fun night in town to hear amazing live music. If you have the chance, check out Rodrigo y Gabriela on Pandora or wherever you find your music. You are in for a treat. Have you found any new favorites through Pandora or another streaming music service? Please share. I first heard Rodrigo e Gabriela at a friend's house. Their guitar playing son had played their music. I was tickled to hear them over the airwaves on SiruisXM Margaritaville radio several months ago. They are truly talented. As far as Pandora - what a GREAT invention! We have so much fun creating new playlists and hearing new music there. Hurray for technology!! This is one great example of the benefit of technology. And Pandora is great, because I can try on so many different musical styles. Hooray, indeed! Thank you for stopping by, Laura! Sounds like it was a great show! Their story is interesting too. It was so much fun! So much talent and energy. I love Pandora for finding new music. Glad you were able to see them live. This is one great example of the benefit of technology. Pandora is great, because I can try on so many different musical styles. They were amazing! So much talent and energy! I saw them here in Baltimore at an outdoor venue about 5 years ago. They were incredible! We were so lucky to get tickets. They were amazing! So much talent and energy! Thank you for stopping by! Hi Kelly, you've got me intrigued, sounds fantastic! A great night out, thanks for sharing the tunes. I absolutely love concerts! Sounds like a great time. We were so lucky to get tickets. They were amazing! So much talent and energy! Thank you for stopping by, Nikki!